The Appalachian Trail is a hiking footpath stretching about 3600 km through 14 states from Georgia to Maine along the eastern mountain ranges of the USA. After successfully completing the Bibbulman Track in WA in 2008, we decided that maybe hiking the AT was possible for us and started serious planning for it. We would have to average 20 km per day if we were to complete the trail in the 6 months allowed by our visa, so we had to accept from the start that we might only complete a part of the whole thing. The trail starts on Mt Springer in Georgia and finishes on Mt Katahdin in Maine, but climbing of Mt Katahdin is banned after October 15 because of the likelihood of severe weather, so that we would have to start the trail at Mt Springer between March 15 and April 15. April Fools Day seemed an appropriate start day for us, which gave us a chance to complete before Oct 15, but meant that the first few weeks were highly competitive for campsites. Many hikers now are doing the trail in sections to avoid the crowds. We kept a trail journal while walking, but the trip affected us in many ways that don’t show in the writing at the time. For that reason, we used the journal to reference the events and wrote the following stories exactly 365 days later. Follow the link below to read our stories. 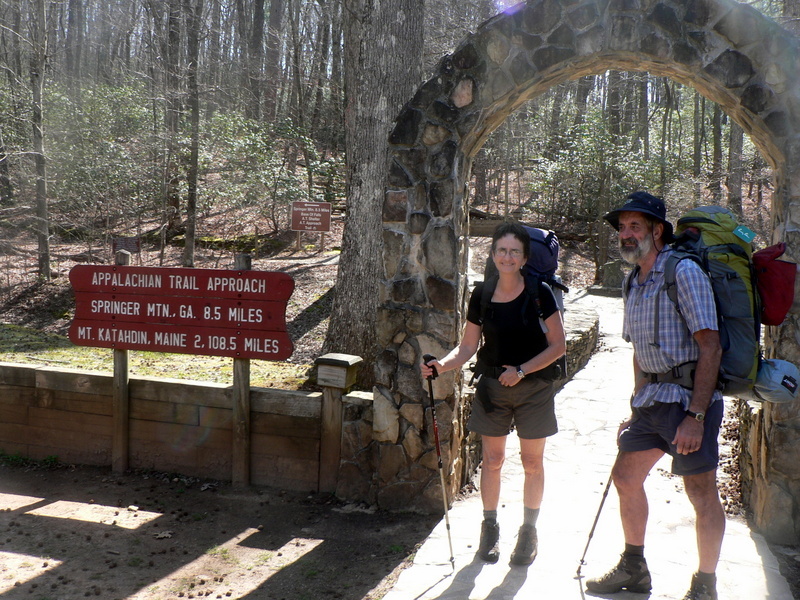 Alison and Digby on Day 1 of their Appalachian Trail odyssey.